This letter is sent on behalf of the Campaign for Clean Air in London in response to the Consultation by the Department of the Environment, Food and Rural Affairs (Defra) on the draft Climate Change Bill. Annual Budgets for CO2 would be more effective at tackling climate change than five year Budgets. How can the Government, as the Environment and Climate Change Minister was doing in New York on 8 May, encourage companies to treat carbon (i.e. budgeting and) reporting as the same “no-brainer” as proper financial (i.e. budgeting and) reporting as part of the Government’s Carbon Disclosure Project, when it will not set Annual Budgets for CO2 itself? Other points are raised in this letter on which your comments would be most welcome. Finally, we ask for your advice, support and, if appropriate, personal intervention to ensure that air pollution – primarily climate change and air quality – matters are addressed holistically as part of the numerous, rapid changes currently taking place in direct and closely related European Union (EU) and UK legislation and in national and local Air Quality Strategies currently being revised. The Campaign for Clean Air in London has only one aim which is to achieve urgently at least World Health Organisation (WHO) recommended standards of air quality throughout London. Most of these have been required to be met since 1999 legislation by January 2005 (in respect of coarse particulate matter i.e. PM10) and January 2010 (for nitrogen dioxide i.e. NO2). We have written recently therefore to the Olympic Delivery Authority asking it to commit, as part of its wider commitment for London 2012 to be the greenest Games in modern times, to London achieving sustainably at least WHO recommended standards of air quality throughout London by no later than the London 2012 Summer Olympics. You were copied on that letter. Subsequently, the Mayor of London has made a landmark speech, setting out a vision of an economically successful, socially just and environmentally sustainable London to be achieved within the next five years before it faces challenges from the rapidly growing Asian cities. It is hard to imagine a better legacy from the London 2012 Summer Olympics. The Campaign for Clean Air in London has received support from the Mayor of London, leading politicians from the four main political parties in London as well as leading business and community groups including the Central London Partnership, London First and The Knightsbridge Business Group. We have recently received a pledge of support from the National Society for Clean Air and Environmental Protection. Our campaign website is shown in the letterhead above. I wrote to you on 12 November last year and again on 5 January this year, on behalf of The Knightsbridge Association which supports our campaign, and have still not received replies to those letters. The Campaign for Clean Air in London supports fully the general plans for a Climate Change Act broadly along the lines of the draft Climate Change Bill. We believe furthermore that it is necessary urgently to establish a robust, consistent and ambitious legal framework to tackle air pollution holistically from the EU down to national, city and local level. In this regard, it is essential to treat both air quality and climate change measures in all air pollution proposals. “Governments have a crucial supportive role in providing appropriate enabling environment, such as, institutional, policy, legal and regulatory frameworks, to sustain investment flows and for effective technology transfer – without which it may be difficult to achieve emission reductions at a significant scale”. This recommendation was categorised as “high agreement, much evidence” which you will know is the highest of nine categories used by the IPCC to communicate the importance and certainty of a recommendation. “While studies use different methodologies, in all analysed world regions near term health co-benefits from reduced air pollution as a result of actions to reduce Green House Gas (GHG) emissions can be substantial and offset a substantial fraction of mitigation costs (high agreement, much evidence). ·Including co-benefits other than health, such as increased energy security, and increased agricultural production and reduced pressure on natural ecosystems, due to increased tropospheric ozone concentrations, would further enhance cost savings. Again, we note that “high agreement, much evidence” is the highest of nine categories used by the IPCC to communicate the importance and certainty of a recommendation. These recommendations could not be clearer or more firmly stated. Against this background, how can the UK not adopt an holistic approach to air pollution in the forthcoming Climate Change Bill? Particularly when a simple mechanism would achieve the required effect? Everywhere, people and organisations, including Defra, are saying that air quality and climate change are inextricably linked but, for some unknown reason, the UK Government has done nothing about treating the two holistically in the biggest piece of UK sponsored air pollution legislation since the Clean Air Act. We found only two incidental mentions of air quality in all the Climate Change Bill consultation papers. You have today put the UK at the forefront of measures to address Climate Change and thinking generally about Air Pollution. Sincere congratulations. From your statements and press release today there is nothing explicit about treating Air Pollution holistically i.e. Climate Change and Air Quality. Also, we hope there will be a separate Environmental Contract to come covering air, energy, waste, water etc. We’ll read all the documents but below is an “off-the-cuff” reply to your Consultation. The draft Climate Change Bill seems to address only the Climate Change aspects of Air Pollution, mainly carbon dioxide. 1. Unless the final legislation addresses also the Air Quality aspects of Air Pollution (mainly nitrogen dioxide, street level ozone and particulate matter), we could see a Parliament, worried about missing Climate Change targets, insisting on more diesel engines which produce 20% less carbon dioxide but much more of the particulate matter that triggers several thousand deaths a year across the United Kingdom. 3. In each annual report to Parliament, any Climate Change recommendations should take full and explicit account of and highlight Air Quality compliance issues. [We are] leaving it to others to argue whether the “Milestones” or “Carbon Budgets” should be annual, five yearly or some other frequency since the above approach for Air Quality is flexible enough to cope with any outcome. In [our] view though, annual Milestones that are taken seriously and delivered upon are as necessary for Climate Change as they are for Air Quality. Climate Change campaigners could learn from the poor experience in respect of Air Quality whereby EU legal limits for particulate matter were breached in 2005 and then in even more UK cities in 2006. We have no idea when the Government expects these EU legal limits to be met even though thousands of citizens every year face the prospect of an early death from this one pollutant alone. Please take this request seriously. By treating Air Pollution holistically, thousands of lives could be saved. Given that the UK Government is setting a precedent for the world with such proposed legislation, there would be great value in it adopting an approach that would truly lead the world. Furthermore, the above approach could be used in all other areas to ensure a robust, transparent and consistent approach to air pollution locally, nationally and internationally e.g. in EU legislation and/or in commitments made by the Mayor of London and the local London boroughs. We encourage them to do so also. viii. whether the UK Government agrees that enforcement is a crucial part of any effective legislative framework. These are important points and your insights would be appreciated greatly. 1. the Defra sponsored Air Quality Expert Group’s report published recently called “Air Quality and Climate Change: A UK Perspective” included (at least) two alarming statistics. First, they expect a 93% growth in nitrogen dioxide (NO2) emissions (in tonnes) from diesel fuelled cars between 2002 and 2020 (with a huge shift from petrol to diesel) – see page 164. Second, the report states that life cycle emissions of diesel cars over petrol result in 67% more each of NOx and particulate matter (PM10) although perhaps 20% less carbon dioxide (page 186) – and they cast doubt on the extent of the latter benefit. It may seem attractive to let this happen from a narrow climate change perspective alone but such an outcome will mean worse air pollution overall with a disproportionate number of deaths from poor air quality (since PM10 alone causes between 12,000 and 24,000 premature deaths in the UK annually). It is vital therefore that strategic measures are introduced soon to discourage the long term shift from petrol to diesel vehicles in cities (as well as reducing vehicle use generally) if we are to head off this trend and save tens of thousands of lives. Sadly, the shift to diesel would almost completely undo the likely benefit from improved engine technology in the same period (according to the same report). The IPCC’s third and final Climate Change report highlighted the spiralling growth of transport emissions as a key climate change problem. 6. the Mayor has emphasised that he has no control over taxation policy to implement effective fiscal incentives and penalties to help reduce transport emissions which contribute to poor air quality and climate change. Please will you press within the Government most particularly for incentives to be introduced. Thank you for taking seriously our concerns about air pollution in London and giving the issues we raise your particular attention. 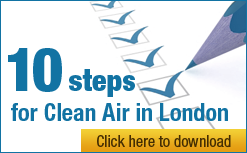 We recognise that you are already taking many steps that will improve air quality across the UK. We are copying Commissioner Dimas since the issues raised may be relevant in other countries if the Climate Change Bill becomes legislation as we hope it will (suitably amended). Please acknowledge receipt of this letter. We look forward to hearing from you (at the email address below).